The index opened strong around 7543 and went up to the highs of the day around 7584 within the first few minutes of trade. Profit booking at higher level saw the index close a bit lower at 7538.75, gain of 28.55 points. The broader market was positive with 822 advances to 735 declines. The range stays at 7000-7700. 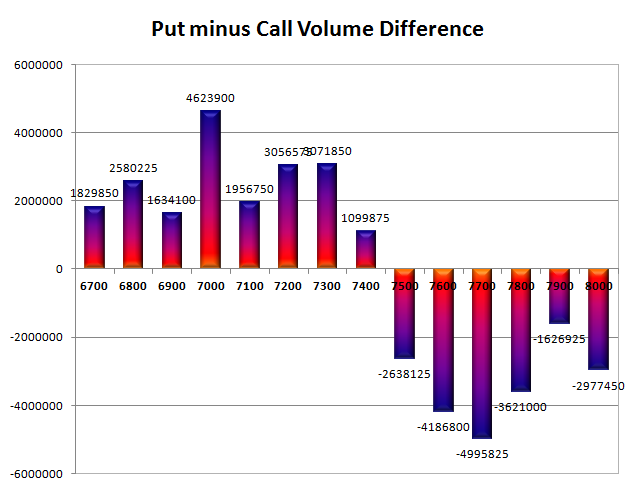 Call option 7600-7700, 7900-8000 added huge 15.86 lacs OI with short covering seen at 7400 and below strike prices. Put option 7600-7300 added huge 13.97 lacs OI with profit booking seen at 7200 and below strike prices. 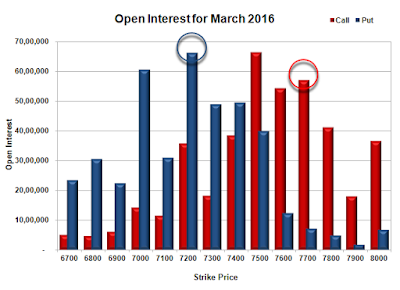 Nifty Open Interest is at 2,17,55,325 down by 2,49,600, with increase in price, most probably short covering. 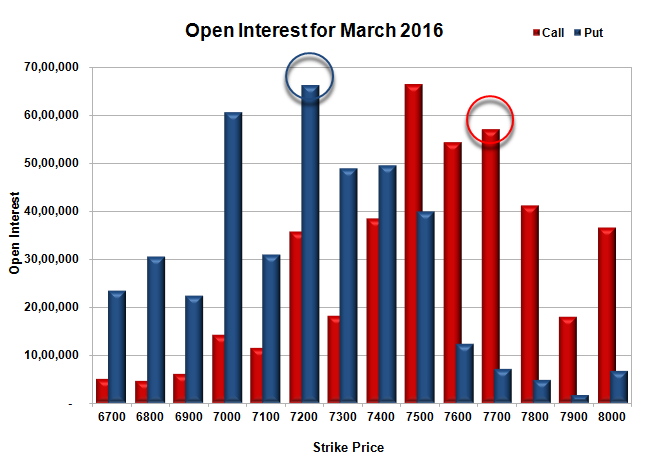 Bank Nifty Open Interest is at 18,75,780 up by 23,670, with increase in price, most probably long build-up. FII’s bought 3.71 lacs Futures, which includes net 8012 contracts long build-up and 6841 contracts short covering, with increase in net OI by 1171 contracts, includes 34300 longs to 19447 shorts for the day. FII’s Index future open contract as on date is 184822 Longs to 128363 Shorts, Net 56459 up by 14853 contracts. 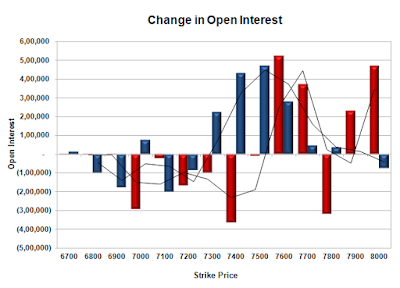 Initial support at 7500, with huge OI addition of 4.67 lacs and below that at 7400 with OI of 49.52 lacs. 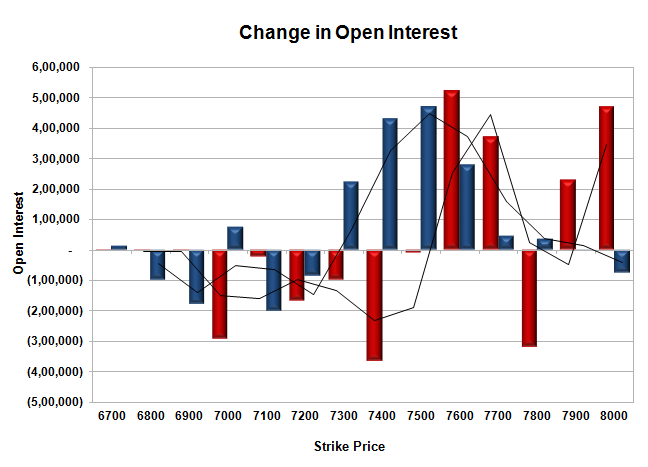 Initial and best resistance at 7600, with OI of 54.31 lacs and above that at 7700 with OI of 57.15 lacs. Day Range as per Option Table is 7461 - 7623 and as per VIX is 7471 - 7606 with 7546 as the Pivot.